Restaurant decoration has become one of the main areas of concern for customers. Today, it’s not enough to have a good product, menu and location. Customers demand special atmospheres to wine and dine where they feel comfortable, places that convey feeling and transport them to new worlds. At Verdissimo, the leading producer of preserved plants and flowers, we’re aware of this. That’s why we’re devoting this post to telling you relevant details about restaurant decoration. 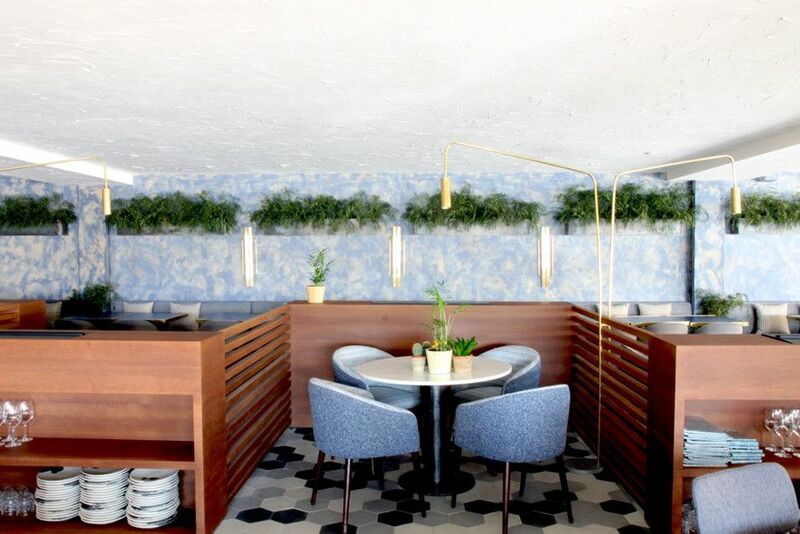 In this article, we’ll tell you about restaurant decoration trends for 2019 and give you some ideas for decorating small restaurants. We’ll even go through the main decorative styles that are trending this year. 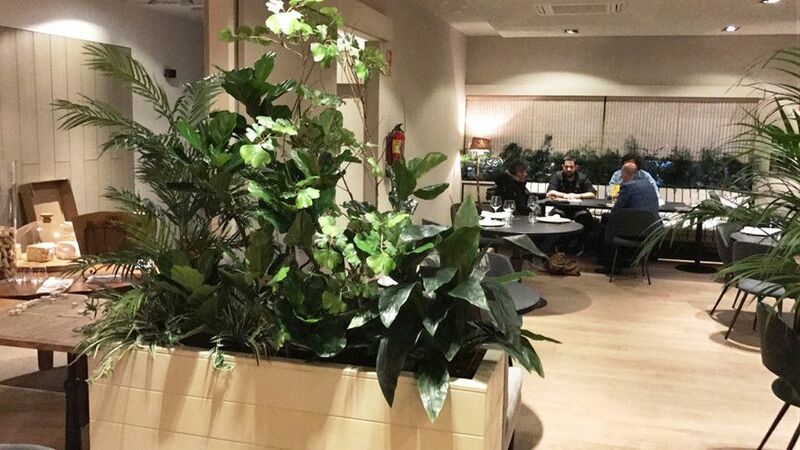 Greenery has become one of the main decorative elements for restaurants in 2019. 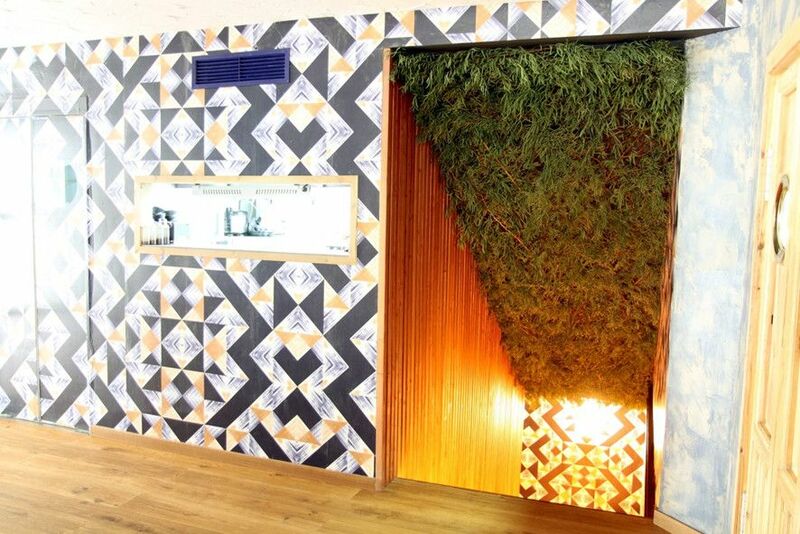 The interest in incorporating green elements in restaurant interior decoration hasn’t stopped rising. Different formats and designs are continually created, such as a vertical garden for decorating walls, plants and flowers in hanging pots, etc. These designs can be done using different types of plants and flowers, including: artificial, natural or preserved. Decorating a restaurant with preserved flowers is a great option! 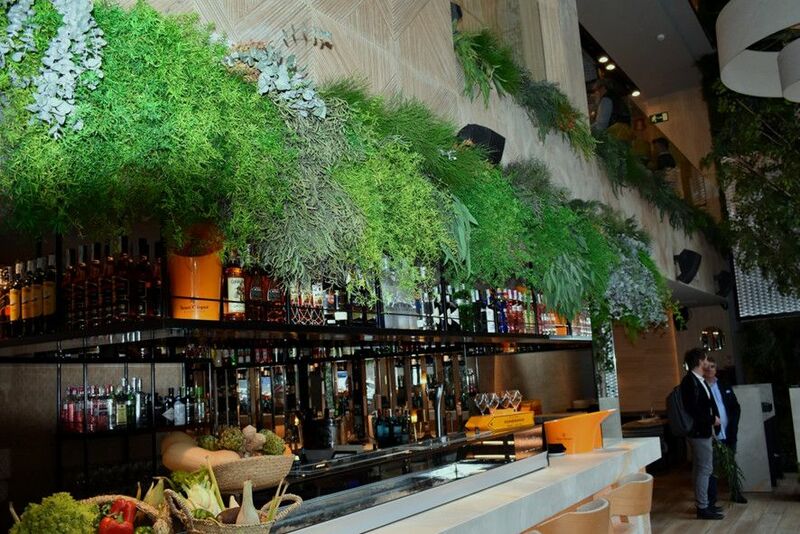 At Verdissimo, we offer preserved plants and flowers for restaurant decoration, perfect for because they’re natural flowers that maintain their beauty over time without needing hardly any maintenance (they don’t need water or light). Ironwork has become another key decorative element this season in restaurant decoration. Ironwork alone offers many possibilities, though it’s often combined with metal to create a striking contrast in materials. This decorative element is related to the industrial style, though in recent years, it’s also been seen in more vintage-style restaurant decoration. Usually, it’s used in lamps, pots, doors, chairs, tables, etc. Any furniture that uses ironwork will be a decorative trend for your restaurant in 2019. Ironwork is so versatile that you can adapt it to today’s trends and your personal tastes. Cement tiles, also known as mosaics, are decorative pieces that can be used on floors or walls. These tiles are very common in 20th-century houses. Although many of them were destroyed, there are still many buildings from this era with them. Today, buildings with cement tiles are maintained and restored, due to their great decorative value, among other things. Currently, cement tiles aren’t only used in home decoration. Every day, more and more restaurants are decorating their bathrooms or some dining room walls with mosaics, which gives lots of personality to any space. Look at the following image to see what cement tiles look like on walls! Lamps in general are able to completely turn around the decoration of any space. Hanging lamps are used to decorate restaurants today. There are many different styles and some are used to break up the style of the space, giving it a unique and personal touch. Today, we can see hanging lamps with hand-woven cords for vintage restaurant decoration, hanging lamps with ironwork for more industrial restaurants, hanging lamps made of wicker, aluminum hanging lamps for restaurants with more Nordic decoration, etc. Below we’ll show you hanging lamps with visible lightbulbs. The creation of different areas in the same space is another trend in 2019 restaurant decoration. You can create more private spaces in large restaurants by using the right decorative elements, such as: indoor trees, side tables, sliding doors, glass, etc. You can also play with the intensity of lighting to create different areas in a single space. Creating different areas allows interior decorators to make the most of spaces by playing with the furniture, greenery and lighting, among other things. In the image below, we’ll show you how you can create different areas, separated by greenery. In this section of the article, we’ll give you some ideas for decorating restaurants with few square meters. Color is key to making small spaces seem larger. We recommend that you use neutral and light colors to decorate small restaurants, especially prioritizing white or light gray tones. You can also opt for beige or cream if you want to give a more rustic or farmhouse look to the restaurant. For small restaurant decoration, you should look for multipurpose solutions. Taking advantage of every square meter is key. One solution could be to look for furniture that has more than one function, such as: using shelves as space separators and as storage. Functionality is key in decoration in general, but in small spaces it takes on even more importance. Generally speaking, round tables take up less space that rectangular tables. You can combine both and use round tables in smaller corners. Combining different elements is in style, so don’t worry about the result. In the image below, you can see how round tables look in small spaces. Benches take up less space than chairs. For some tables in a small restaurant, you can use benches and save space. They’re comfortable and a hit aesthetically with locals, since they don’t take up much space. We’ll show you an image of how benches look in restaurants. Wondering how to decorate a restaurant? 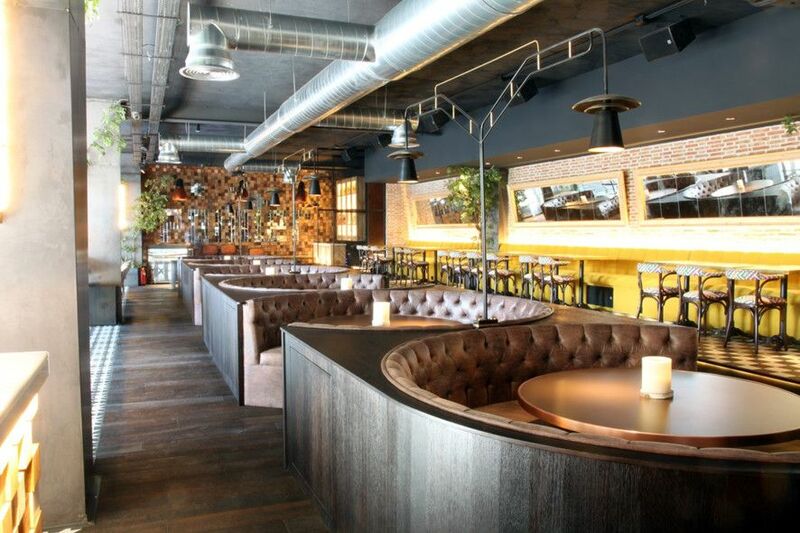 What is the most appropriate decorative style for modern restaurants? The most important decorative styles for homes can be applied to decorative styles for restaurants. Some of these decorative styles are the following: Nordic, boho, vintage, modern and navy styles. We’ll give some details about each one below! Nordic-style restaurant decoration emphasizes neutral colors, simple shapes and minimalist atmospheres. Usually, white and gray colors, as well as simple furniture, are used in this style. 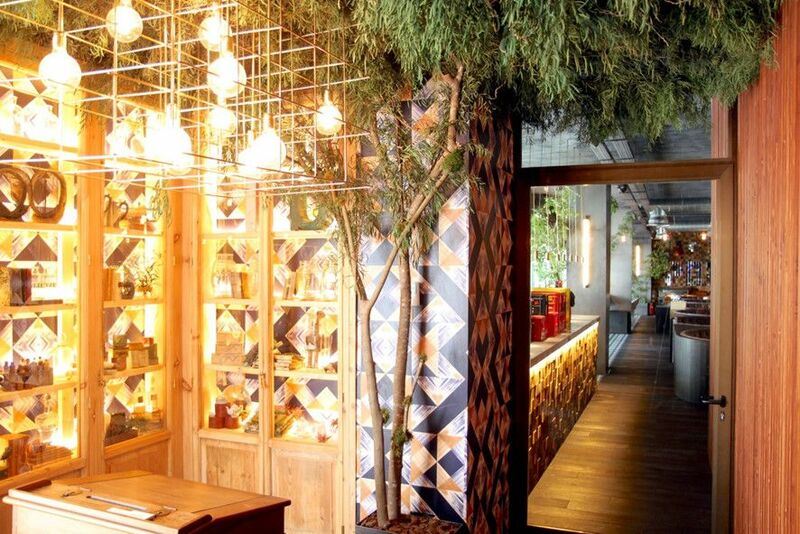 Boho-style restaurant decoration stands out for its mix of vibrant colors, including: red, green, yellow, blue, etc. To achieve this decorative style, you must combine vibrant colors, as well as different fabrics and elements. Vintage-style restaurant decoration is one of the most popular this season. Some ideas for a vintage-style restaurant include distressed furniture and elements with golden details. Modern-style restaurant decoration is very minimalist and seeks to create neat spaces and uniform lines. For decorating these spaces, subdued colors are used, such as: black, white, light gray, dark gray, etc. 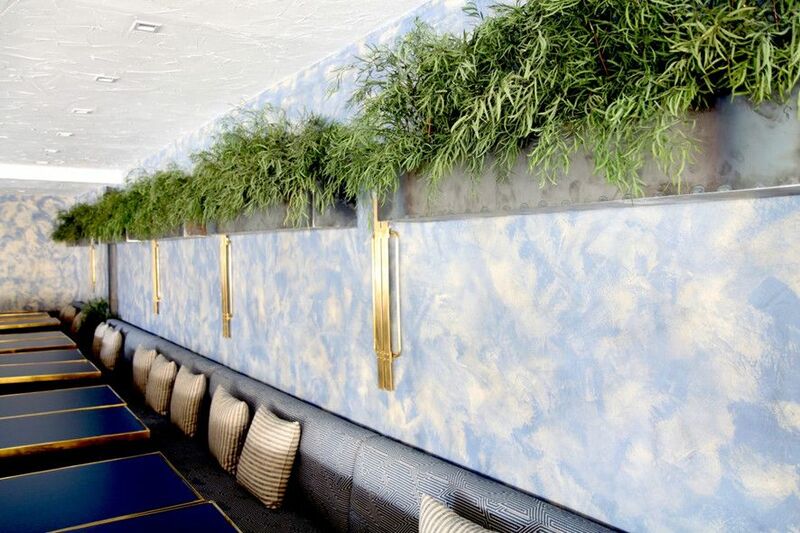 Navy-style restaurant decoration is typical for Mediterranean spots. This style is backed up by colors such as white and blue, and uses wooden furniture. Also, it’s known for its use of marine decorative elements, such as helms or other objects that can be found on boats. Any decorative style used at a restaurant should mirror the business’ philosophy and the type of restaurant. For example, at an Indian restaurant, it wouldn’t be advisable to use Nordic decoration for the space. Instead, it would be more appropriate to use boho decoration, which uses color and a blend of many elements and different materials. We hope this post has inspired you and given you ideas for decorating a modern, boho, vintage, etc. restaurant. Remember that decorating any place is important for conveying the story, food and philosophy of the restaurant.